In a failed effort to get re-elected the Ontario Liberal governent decided to cut hydro rated for consumers despite the fact that the cost to produce, distribute and administer electricity in the province continues to climb due to years of mismanagement. Electricity costs increased another 4% on May 1, 2016. The government blames the latest increase on the recent mild winter which resulted in lower electricity consumption. After raising hydro rates every year for the past 8 years, resulting in a cumulative increase of 140%, the fact that they even feel the need to offer an excuse for this particular rate increase is laughable. To add insult to injury, previous increases tended to be most concentrated within the on-peak and mid-peak periods. This allowed the government to claim that consumers could help compensate by shifting their consumption to off-peak hours. With the latest rate hikes, the highest percentage of increases went toward off-peak rates, which increased 4.82%, while mid-peak and on-peak rates climbed 3.12% and 2.86%, respectively. Adjusting rates every 6-months helps to obfuscate the annualized increases so we used the Ontario Energy Board's latest data to calculate annual increases effective May 1 for each of the past 9 years. According to the OEB, the average consumer uses 750 kWh per month with 1/3 of their consumption during off-peak hours and the remaining consumption split between mid-peak and on-peak hours. Note that this chart just shows the electricty portion of the bill. Generally, this is only about 56% of your total bill which also includes distribution, transmission, regulatory fees, etc. Just imagine if your wages went up at the same pace as the cost of electricity. This would mean that if you were making $34,000/year back in May of 2008, you should now be making $82,000. Not long ago, LED lights were really not up to the challenge of replacing traditional incandescent and compact fluorescent (CFL) lights because they were just not bright enough. That's all changed now. 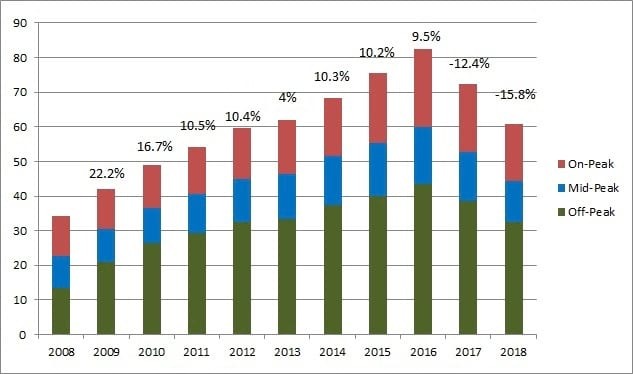 LEDs are still relatively expensive at a cost of about $10/bulb but the price will most likely continue to come down as competition increases. So, is it worth spending the money on replacing your existing household lights with LEDs? To find out read the cost benefit of LED lighting. Why is Electricity So Expensive in Ontario? There are many reasons that the cost of electricity in Ontario is higher than most other jurisdictions in North America. The primary reason is the high feed-in-tariff rates that the government pays for green energy. When the FIT program was first introduced, contracts were signed that agreed to pay 80 cents/kWh for solar power. Current solar power rates range from 27.5 - 38.4 cents/kWh. The more of these contracts that are signed, the higher Ontario's electricity cost will be. Another reason that Ontario electricity rates are so high is that empoyees of the Ontario Energy Board, Ontario Power Generation and Hydro One make enormous amounts of money. You would think with almost 80% of their employees making more than $100,000/year they would have plenty of money to fund their own pensions. Apparently this is not the case since taxpayers contribute $5 for every dollar Hydro One employees contribute. Here is a partial list showing the bloated salaries of the people in charge of hydro in Ontario. Does it Make Sense to Switch to an Electicity Retailer? If you decide to buy your hydro from your local Ontario hydro utility, the electricity rate that you pay is set by the government of Ontario (the RPP rate). This price generally changes every 6-months, on May 1 and November 1. Since 2009, utilities across Ontario replaced meters used by residential customers to introduce Time-of-Use meters, so called, "Smart Meters". The utility companies use a different pricing formula for customers with time-of-use meters, since these meters can not only report on how much electricity you use but also when you use it. 90% of Ontario's Hydro users are now billed based on time-of-use. Here are the Ontario Hydro Rates in effect as of May 1, 2018 and continuing until Apr 30, 2019. If you are in this camp, the only way you can save money on your electricity bill (besides using less electricity) is to try to shift your consumption to when the rates are cheaper. This is primarily between 7:00 PM and 7:00 AM weekdays and during the weekend. For example, don't turn on your dishwasher at 6:00 PM, wait until after 7:00 PM to run it. A typical homeowner uses about 750 kWh/month and generally about 65% of this is used during off peak periods with the remainder being divided between mid peak and on peak periods. Before considering any other options you should always look at your hydro bill to see what your exact "load profile" is. That is, when you use your electricity. More specifically, you need to calculate your weighted average price across all demand periods. Obviously, if you use most of your electricity at off peak times, your weighted average will be lower than if you use most of your electricity during peak times. Click on the following link to calculate your Blended Rate using your historical hydro bills. Ontario Electricity Retailers cater to consumers who want longer term electricity price protection. Electricity retailers in Ontario can provide a fixed electricity rate for up to five years. For residential consumers, electricity retailers generally offer one fixed price per kWh, regardless of when the electricity is used and how much hydro is consumed. When comparing fixed electricity rates offered by energy retailers with the RPP rate charged by your local utility there is one very important difference that you must be aware of known as the Global Adjustment. All of the extra fees on your hydro bill (such as delivery fees, admin, debt retirement, etc.) will generally be the same regardless of whether you purchase hydro from your local utility or an electricity retailer. The one exception is the Global Adjustment. This will be added to you bill only if your electricity is supplied by a retailer (since this charge is already embedded in the RPP rate). Take a look at this chart which shows some historical Global Adjustment rates. Generally, fixed rate plans are only cost effective for consumers who use the majority of their power between 7am and 7pm on weekdays. Most homeowners use the majority of their power outside of these hours. A possible exception would be people who work out of their home and tend to go away on weekends. During the period from November 2015 - April 2016 a typical homeowner who used 2/3 of their power during off-peak periods had a blended rate of about 10.6 cents/kWh. 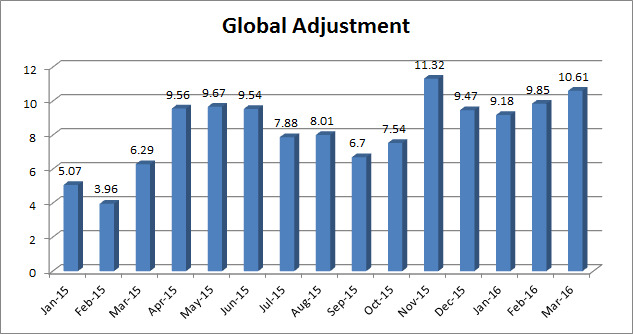 Incredibly, the Global Adjustment during this period was about 10.4 cents/kWh. Therefore, a typical homeowner who switched to an electricity retailer would need to pay 10.4 cents/kWh on top of whatever the retailer is charging for electricity. So, unless the retailer is offering free electricity, you would not save by switching to a retailer. For businesses there may some cases where switching makes sense. This is because most businesses are open during "normal business hours" Monday through Friday. This is when regulated rates are the highest, so a business user's blended rate could be 15 cents/kWh or even more. Therefore business users may benefit from switching to a fixed rate that does not depend on the time of day that the power is consumed. Use the blended electricity rate checker to find out how a fixed rate compares to what you are paying now. If you find that you are paying more than the sum of the Global Adjustment and the fixed price offer it could make sense to switch to a fixed price. Even this is difficult to determine since the Global Adjustment tends to increase over time. When Ontario Power Generation applied for a rate increase in 2011/2012 to offset their spiraling union wages the Ontario Energy Board denied some of the increase and the case ended up being adjudicated by the Supreme Court of Canada. The Supreme Court ruled in favour of the OEB in their assessment that "OPG's staffing levels and employment costs were too high". You can read about this case in this Law Times magazine article. Ontario NDP Leader Andrea Horwath led a rally in Oshawa agaist the Liberal government's plans to privatize 60% of Hydro One. Attendees are concerned that the privatization will trigger further hikes in electricity rates much the way that the 407 tolls where jacked up when it was privatized back in the 90s under Mike Harris. Guess Who Will Be Paying for Hydro Pension Shortfall? Two of Ontario's hydro companies are on the Canadian bond rating agency, DBRS' top 20 list of worst funded pension plans. Ontario Power Generation (OPG) is cited as having the worst deficit of $3.3-billion and stated that the corporation has fallen into the ‘danger zone’. Hydro One Inc. is indicated as having a pension shortfall of $1.5-billion and is 8th on the list of worst deficits. This deficit works out to a staggering sum of $288,000 per employee. Ontario ratepayers can expect that these shortfalls to fall on their shoulders as these pension liabilities require funding. With the latest increases the Ontario government will be netting about $44 million a month more from ratepayers in the province. The increase in power rates won't stop there however, the Ontario Auditor General reported last year that Ontario power rates will increase a whopping 45 percent by 2015. In this article, Ontario Hides the Cost of Relocating Electricity Plant, the author talks about the Ontario Government's attempt to cover up the true cost of their decision to scrap the planned Gas-fired electricity plant in Oakville. The author claims that "major additional costs to TransÂ­Canada and others are likely buried in documents that may never see daylight." He goes on to say that these cost, in the billions of dollars, will ultimately end up on your hydro bill. The outrageous increases result in a 12.5-per-cent hike for time-of-use billing customers, according to energy analyst Tom Adams. Adams blames the new rates on an array of heavy spending in the sector by the Liberal government. In 2010, the government predicted hydro bills would rise 46 per cent by 2015. Half that rise is attributable to the expensive long-term contracts. According to Adams, we are already tracking way higher than those numbers, we are seeing double-digit increases rather than the 7.9 per cent per year predicted by the McGuinty government. According to energy analyst Parker Gallant, and University of Guelph’s Glenn Fox, the Ontario government’s wind and solar energy policies will cost about 40 per cent more than their own estimates. After originally predicting rates would only rise by one per cent, the government admitted a few months ago to increases of 46 per cent and 100 per cent! Dalton McGuinty announced that the Ontario government will be investing $80 Million to develop electric vehicle charging stations throughout Ontario. Mr. McGuinty noted that the estimated $7 to "fill up" with electricity is a far cry from the $70 most people spend on a gasoline fill up. The government will also be subsidising the purchase of electric cars to the tune of $8,000 per vehicle with a goal of having 5% of all vehicle run on electricity by 2020. One of the unforseen consequences of the Ontario Government's plan to add solar and wind capacity to the Grid at guaranteed rates is that sometimes the power generated is not needed and results in temporary overcapacity problems. When this happens, not only does the Ontario government have to pay extremely high rates for the wind and solar power (up to 81 cent/kWh for Ontario's Solar MicroFIT program), they may also have to pay to offload the power to other jurisdictions such as Michigan. To help combat this problem, the Ontario Goverment is requesting large Wind producers to forecast wind production and remove production during periods of over supply. The Ontario Power Authority will continue to pay the contractual rate for the power not produced. Of course, these charges will be offloaded to Ontario consumers in the form of rate increases. If elected, the Ontario Conservative party leader has vowed to put an end to the McGuinty government's MicroFIT program which pays up to 80 cents/KwH in Feed in Tarrifs to small roof-top solar power producers.